Texas Motor Speedway president Eddie Gossage is so butthurt over this weekend's NASCAR race being double-booked with Circuit of the Americas' United States Grand Prix that he's adamant that COTA shouldn't get NASCAR or IndyCar—ever. I hate to break it to you, man, but sound management decisions aren't typically built on butthurt. This is a strange weekend for race fans in Texas, with the bizarre double-booking of NASCAR and Formula One happening at the same time less than 200 miles apart. I agree that it's totally absurd, especially when even the television coverage is booked right at the same time for both. If you're a fan of both, I hope your DVR works. 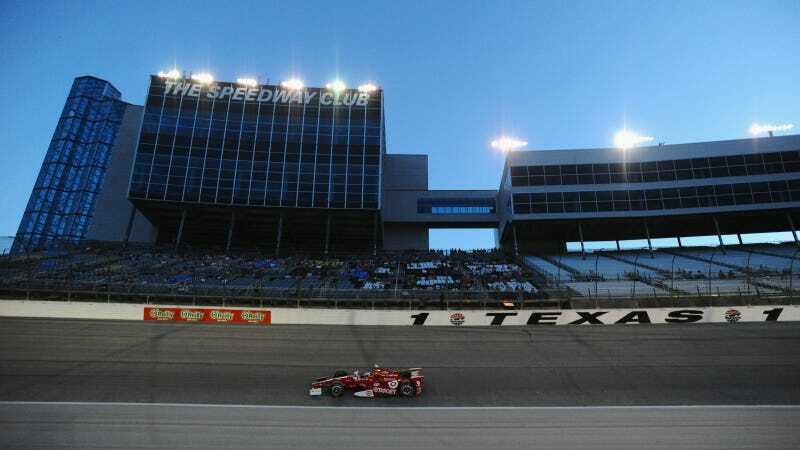 NASCAR and IndyCar are the two main events that anchor the calendar at Texas Motor Speedway, an oval course in Fort Worth, Texas. While NASCAR's schedule barely has any breathing room at all, IndyCar could easily sneak in a race at COTA, which is a road course in Austin. For 2015, IndyCar opted to focus their more limited resources on making the race weekends they have an existing relationship with as good as they possibly can. That makes sense for a series trying to reestablish its fanbase, but Circuit of the Americas still tops many fans' wish lists for venues in the future. Anybody that you do business with, you deserve loyalty. I look at races as the sanctioning body is a wholesaler and they sell you a product and you turn around and retail it to the public. If you've been the (retailer) for all this area and all of a sudden they want to bring in another distributor and it's going to cut into your deal, that's not OK, that's not appropriate. We have not only earned loyalty in IndyCar, we've paid dearly for it (in sanction fees), huge sums of money that nobody else in the history of IndyCar racing has been required to pay to keep it. Uh-huh. Loyalty. So, where was this outrage when the Houston Grand Prix was still running in the same state? Houston's IndyCar grand prix dropped from the schedule this year, but that made sense. It was a largely unloved street course that even ardent fans of IndyCar had trouble enjoying. It proved one thing, though: Eddie Gossage is wrong about scheduling races in other parts of Texas, particularly if the other option isn't even an oval, and likely wouldn't be booked on the same date as one of TMS' main dates. The F1 double-booking happened primarily because the international series saw NASCAR as more regional, and as less of a threat to ticket sales. NASCAR or IndyCar likely wouldn't pull the same stunt. Texas may be a large state, but our fans travel well to the events we want to see across the state. A road course outing added to the schedule simply isn't going to eat into the TMS weekend in the catastrophic manner Gossage describes. Most of us would be happy to see two Texas dates back on the schedule. To imply that nearby racing fans can't be trusted to make a decision among multiple IndyCar dates in the state isn't just total nonsense, it's a bit insulting. Schedule the TMS and COTA dates far enough apart from each other and many of us will attend both, bolstering the popularity of both the series and the venues who host them. There is more overlap between fans of oval racing and road course fans than either series perhaps wants to admit, but Gossage's point ends there. Some fans are making the most out of the scheduling snafu, traveling to see both events this weekend because they're so close to each other. Likewise, some teams were taking the opportunity to look at what the other style of racing is doing. Stewart-Haas Racing dropped by COTA to check out how the current teams function, seizing a vital opportunity since Haas will enter the world of Formula One soon. "There are quite a few [NASCAR] guys that watch [F1]. We're amazed at the technology," said Sprint Cup driver Ryan Newman in remarks made to USA Today. "We look at it from a standpoint of how to beat the other guys, whether that means how to use carbon fiber or their braking systems or something like that that can give us an advantage. That's my interest in F1." On the other hand, there are fans you'd see at a COTA IndyCar or NASCAR outing who probably wouldn't go out of their way to see a TMS oval race. You have unique fans to both styles of racing, and some folks just don't leave the house unless drivers are making turns in both directions. Seeing oval drivers tackle a completely different format than most of the races on the calendar is just fun. TMS is unlikely to break out their infield road course for IndyCar or NASCAR, so a COTA race would be a great counterpoint. TMS' infield road course is so oval-banking-heavy that even if TMS negotiated for a road course IndyCar date to spite COTA, it would be a poor substitute for a purpose-built road course. Fans only care so much about venue loyalty. We care much more about seeing a well-organized race weekend, with good, competitive racing and a flawless experience on our end. To that point, TMS has the advantage of experience over COTA. COTA is just three years old, and still obviously working out some of the bugs when it comes to hosting a race there. Still, to say IndyCar or NASCAR shouldn't go to Circuit of the Americas over what happened this weekend with F1's date is absurd. There's plenty of room on the schedules to accommodate both top-level venues in the state, and there's no shortage of demand to see these series at both. The biggest losers in Gossage's imagined fight end up being the fans. That's missing the mark quite a bit if you're in charge of managing a racetrack.